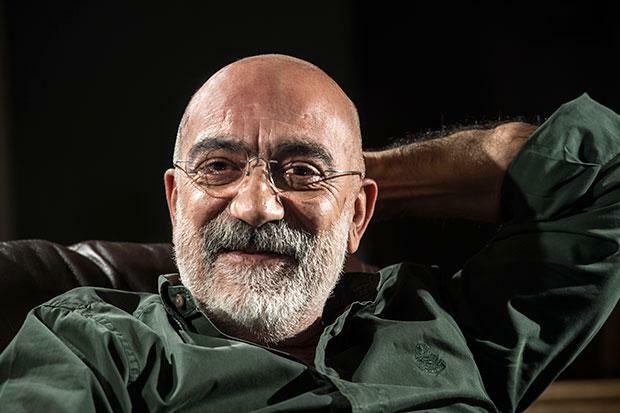 Prominent Turkish novelist and journalist Ahmet Altan, who has been in pretrial detention since Sept. 23 of last year, said in an essay published on Monday that he might be locked up in a prison cell but that he travels the world with his imagination. Altan also details his treatment in İstanbul’s Silivri Prison. “Yes, I am being held in a high security prison in the middle of the wilds. “Yes, I am staying in a cell where the door is opened and closed with the rattle and clatter of iron. “Yes, they give me my meals through a hole in the middle of the door. “Yes, even the top of the small stone-paved courtyard where I pace up and down is covered with steel cages. “Yes, I am not allowed to see anyone other than my lawyers and my children. “Yes, I am forbidden from sending even a two-line letter to my loved ones. “Yes, whenever I have to go to the hospital they pull handcuffs out of a cluster of ironwork and put them around my wrists. “Yes, each time they take me out of my cell orders such as ‘raise your arms, take off your shoes’ hit me in the face,” he said. Altan wrote that he overcomes the difficulties in prison with his imagination as he travels all over the world from his cell. Altan was arrested on Sept. 23, 2016, after a court charged him with giving subliminal messages in favor of a coup on television, membership in a terrorist organization and attempting to overthrow the government. Ahmet Altan and his brother Mehmet Altan, an economics professor and journalist, were first detained on Sept. 10, 2016 and charged with sending coded messages on a television talk show a day before an abortive military coup in Turkey on July 15, 2016.